Changes to module codes and new Moodle have prompted quite a few questions this month. Provide a quiet seat to get away from your email and telephone to organise your readings! 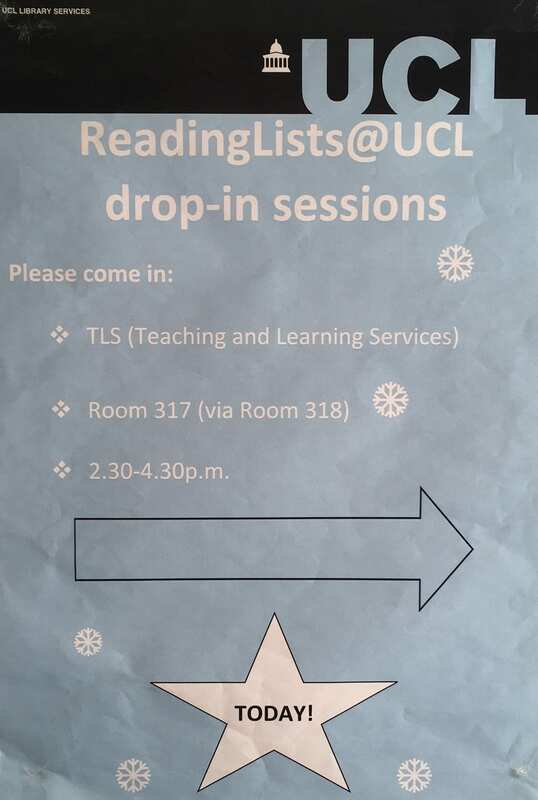 The TLS office is in UCL Senate House, room 318. 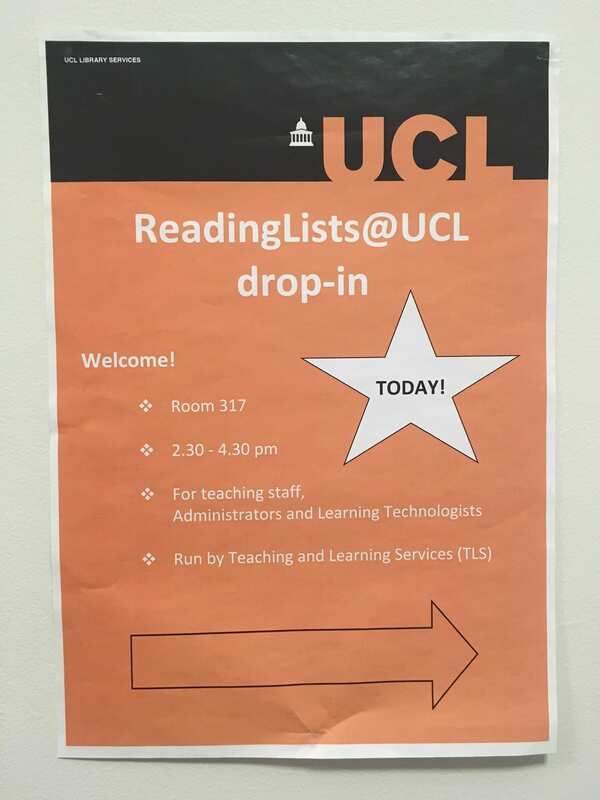 If you aren’t familiar with this UCL Library Hub, come to the South block, third floor and ask at the UCL reception desk; or call the TLS office on 020 3549 5729 (internal x65729). If Wednesday doesn’t suit, or you would like to set your office computer up for working on reading lists, then we are very happy to visit you in your department: do get in touch to arrange a visit! In addition to the Moodle and module code changes, UCL library also has some upgrades this summer. As mentioned in an earlier post, a new Explore interface was soft-launched in autumn 2017. On Monday 10th September 2018 this will become the only Explore search and the ‘Classic Explore’ will be retired. The underlying library catalogue is also being migrated to newer software. What does this mean for ReadingLists@UCL? ReadingLists@UCL can only interact with one catalogue interface, so until the 10th September the reading lists will continue to work optimally with Classic Explore. On the 10th September Classic Explore will be retired and ReadingLits@UCL will have its settings changed to work with the new Explore. This does not affect e-resources: you can bookmark as usual from e-journals, e-books, TV and film resources, and more. How will I know when to use the new Explore? The SFX@UCL button found on some electronic resources will be re-named, as the underlying software has changed. The new ‘FindIt@UCL’ button will work in the same way, leading you to the online resource. As part of the migration there will be a circulation freeze from 5th-10th September. This means the ‘Availability’ information on Explore might not be correct; this only affects physical books and journals that can be borrowed from the library. Availability information is also shown in online reading lists so students and staff should be wary of this; you can ask your site library staff about book availability. Reading lists can usually be found in the Explore catalogue, however as they are listed under their former module codes, and are in the process of having their module codes updated, the information is out of date. We have decided to remove this information until all lists have a new module code, when we will add them back into the catalogue. For more details on this Explore upgrade, including updates about outages, please see the UCL Library news webpage. Moodle has been upgraded this summer and the ‘New Moodle‘ is already available, with the updated 2018-19 module codes. For integrating with reading lists, New Moodle works in the same way as Legacy Moodle: you just need to switch on the ‘Library Resources’ block to make a link to the reading list. There is a more detailed integration which we will update this autumn, to ensure better interaction between Moodle and reading lists: ISD staff need to complete their prioirty Moodle migration work before doing this. ‘Legacy Moodle’ is also still available for reference and also Late Summer Assessments. Students undertaking re-sit exams may wish to re-visit their former reading lists, if they haven’t saved a version. Legacy Moodle won’t link to the 2017-18 reading list as these are now archived. Students can search all current ReadingLits@UCL lists by module name; or if the list has been updated already, we can retrieve the previous version from the archive. The Library Resources block also contains a link to past exam papers. All exam papers are found under their old codes so this link will not work! Students can search Exam Papers online by module title. If you wish to hide the broken link for this year, use the settings of the ‘Library Resources’ block to configure the block. 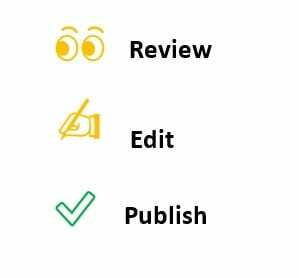 Review the contents of your reading list: edit it to update notes, dates and readings, then publish to make it available to students. If you would like editing access to a reading list, get in touch so we can enable that for you. For help with editing and updating Moodle, head to New Moodle and select the ‘Staff Help’ tab for guidance, or use the ‘Contact Moodle Support’ option there. 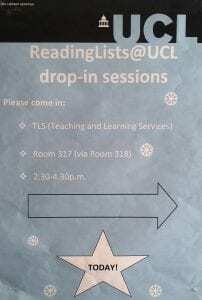 For help with editing an online reading list, please get in touch with ReadingLists@UCL. For sourcing new books, journals, films and more, contact your friendly subject liaison librarian! The rollover is complete! All your 2017-18 lists have been archived and a copy created for 2018-19, which you can edit straight away. Thank you for your patience with the unexpected delay. Over the next few weeks TLS will update the module codes on the new reading lists, in line with the Academic Model Project. Once this is done please double check that the link from Moodle is working as you wish: switch on the Library Resources block to make a direct link to the whole reading list. We will also create new guidance on how to link from Moodle to your reading list, including screenshots from the new Moodle. So now to prepare your reading lists for the new academic year: you just need to review, edit and publish! The rollover was requested to start on Tuesday 17th July, however you will have noticed the 2017-18 lists remain on display. The Talis team identified an issue relating to student numbers so paused the rollover: they updated us on Wednesday 18th with the news that they are testing the fix they have created and will re-start the rollover when they are confident there are no issues. So sorry for this delay! You can contine to edit your 2017-18 lists as usual, but please publish your changes as you work, to make sure they are saved. New 2018-19 reading lists do not roll over and can be used as usual. In TLS we are preparing for the annual ‘rollover’ of ReadingLists@UCL. This is our final task of the academic year: the CLA report of UCL’s digitised readings was sent in June, the majority of teaching has finished, and the exam period too is largely over. Unpublished changes will not copy forward into the new list: please publish your lists before 17th July if you wish your updates to be carried forward. We suggest you stop editing reading lists before 5pm on 17th July, and continue editing when you can see it has the 2018-19 date stamp – certainly from the morning of 18th July, if not sooner. TLS are aware of the new module codes being introduced and will begin updating the reading list module codes from around 19th July. More details in our blog post on this. To have old courses archived, new lists set up, or current module names amended, please email us your requests! Do you need a refresher on how to edit and manage your lists? Drop in to our office in Senate House on Wednesday afternoons, 2.30 – 4.30pm for a quick session. You could walk away with a new list set up and ready to go, get guidance on how to link to non-standard resources, or find out how to embed reading lists in Moodle. The ReadingLists@UCL webpages also have guides, FAQs and contact details. You may have heard of the Academic Model Project, a project to update all UCL module codes. Whilst you may be dealing with the extra work around this for your teaching, please spare a thought for how it will affect your online reading lists! The current 2017-18 module codes remain on the existing online reading lists for any remaining exams, re-sits and continuing students. Around the week of 2nd July the new instance of Moodle will be made available, with new module codes. Around 17th July, ReadingLists@UCL will have its annual ‘rollover’ where lists are archived and a duplicate copy made for 2018-19. The archived list will have the ‘old’ module code on it when archived. From around 19th July onwards we will upload new module codes to the reading lists hierarchy and link the new lists to their new module code. Once this is done, new Moodle courses will link to the correct reading list via the ‘Library Resources’ block. Reading lists can be edited at any time and still found by their module title from the home page search: there is no break in being able to update them. Despite best efforts there is likely to be some messy cross-over between old and new module codes, but we hope this catches the best time to make the switch and still be ready for August when departments might be updating Moodle. Let us know if there is anything not covered here that might affect you! Liaison and site librarians have also been informed and are your contact for other library issues, so do get in also touch with them. Today is Global Accessibility Awareness Day! Here are a few thoughts on how the TLS have considered accessibility in our everyday library services. All course readings digitised by the TLS are run through OCR (Optical Character Recognition) software to ensure they are accessible to those using screen readers. Copyright regulations have changed over the years and our Copyright blog has been following these improvements. Through ReadingLists@UCL we regularly link to e-books and electronic articles; these are subscribed resources provided by the library. Many have good searchability and portability, or features such as read-aloud; however DRM added by the publisher can render them less accessible. There has been some wonderful library-led research looking into just how accessible these platforms are. This project undertook an e-book audit in 2016 and its work is being continued by Aspire 2018. Some initiatives encourage publishers to engage in making their platforms easier to access, such as ‘Praise a publisher – critique a publisher’ in which the library community gave comment and feedback on the publishers who were the most speedy and helpful in providing accessible copies of texts – and any who didn’t quite come up to the mark. While we occasionally still email publishers to request an accessible copy of text on behalf of a student, more often their requirements are more immediately met with the RNIB Bookshare service. 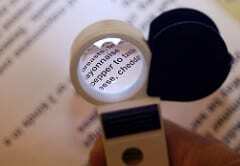 This has grown rapidly in recent years and now some publishers deposit accessible vesions automatically on pubication. Any UCL students who need access the RNIB Bookshare please register with UCL Disability Support who will enable your access. They will also be able to introduce you other relevant support, such as the SENIT suite of specialist IT equipemnt and software. The UCL Library Disability support is also really welcoming: do ask them for key ways they can assist you or someone you know. Want to participate? Raise your own awareness by going without your computer mouse for an hour, or using screen-reader software and turning off your screen. After this experience you might like to go back and make sure your webpages are accessible! Find more ideas on the Global Accessibility Awareness Day website. Try this training event on e-books and disabled readers. Aimed at publishers and aggregators it covers what to look for in accessibility statements. 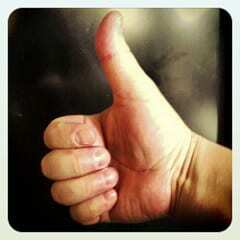 TLS mainly provides IT-based services however accessibility and inclusive design should touch all areas. Current Insta-crush is Sinéad Burke who, amongst other talents, is a charismatic advocate for inclusive design. Follow her to find out more! Our colleagues in Digital Eduction have recently been working on updating the UCL E-Learning Baseline. The e-learning Baseline is now included in the Academic Manual, and offers a best practice template for taught courses at UCL, setting out the minimum expectations of a module. One of the drivers is to support students who need consistent and clear information on their module, readings and assessments. The baseline includes a requirement to have a reading list for students and recommends ReadingLists@UCL; it also clarifies that UCL policy is to have reading materials available for students 48 hours before teaching (both in section 5: Resources). Providing consistency across programmes, and clarity of what reading is required, is one of the most positive feedback messages we have had from students about ReadingLists@UCL. For some modules their reading requirements are spread over a handbook, with sometimes different or additional information in Moodle, and by email: having one consistent place to check makes their life much easier. This also helps the library ensure books and journals are provided in time, and can translate into good feedback for your module. Though reading lists themselves don’t have a baseline, we do run ‘Best practice’ sessions for academics. In a Best Practice Reading Lists session last year we spoke to teaching staff in the Engineering department about recent research around how students use reading lists, and what potential barriers they find in understanding what is required of them, or accessing their essential readings in time. All barriers are very simple to overcome, for example by using the controlled language provided by the ‘Essential’ ‘Optional’ tags on each reading; and dividing the list into sections by topic or by week needed. Enriching your list with personal annotations really helps students understand whether you are pointing to a few readings that could be useful, or a seminal text they can’t get by without. Some academics even like to point to readings they don’t believe have very good arguments, or are based in another library to oblige the student visit another institution: this is also helpful to make clear! This is the Best Practice reading list of a very few resources used during our session. Would you like a similar session for your department, or a quick 1:1 to look at your module? Or would you find a baseline for reading lists a helpful guide? You can reach us by email, or call or visit the TLS. If Wednesday doesn’t suit, or you would like reading lists set up on your office computer or laptop, then we are very happy to visit you in your department: get in touch to arrange a visit!